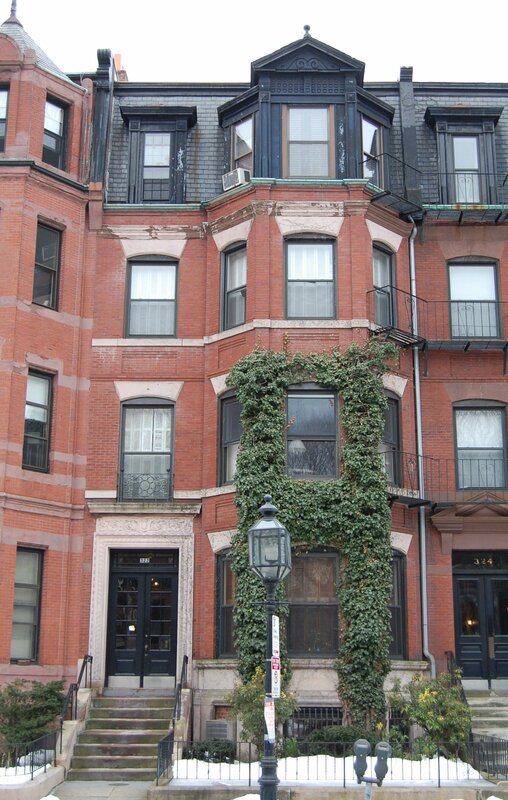 322 Commonwealth is located on the south side of Commonwealth, between Hereford and Massachusetts Avenue, with 320 Commonwealth to the east and 324 Commonwealth to the west. 322 Commonwealth was designed by Bradlee, Winslow, and Wetherell, architects, and built in 1882-1883 by Vinal & Dodge, masons, for building contractor George Wheatland, Jr., for speculative sale. It was one of three contiguous houses (322-324-326 Commonwealth) built in the same design, and one of sixteen houses (322-326 Commonwealth and 336-360 Commonwealth) built on the same block for George Wheatland, Jr., in 1882-1884. George Wheatland is shown as the owner on the original building permit application for 322 Commonwealth, dated September 20, 1882. 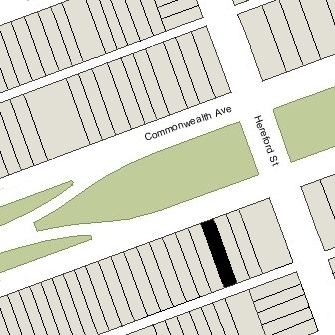 Click here for an index to the deeds for 322 Commonwealth, and click here for further information on the land on the south side of Commonwealth between Hereford and Massachusetts Avenue. On September 25, 1883, 322 Commonwealth was purchased from George Wheatland, Sr., by Frances Josephine (Smith) Sands, the wife of leather and hide broker William H. Sands. They previously had lived at 100 West Concord. The Sands’s three surviving children – Florence Josephine Sands, Ethel Buckingham Sands, and Gertrude Savage Sands – lived with them. Florence Sands died in December of 1897, a suicide. Ethel Sands married in November of 1901 to George Woodbury Duncklee, a lawyer. After their marriage, they lived in Brookline. William Sands died in June of 1908. Frances Sands (called F. Josephine Sands) continued to live at 322 Commonwealth with their daughter, Gertrude. F. Josephine Sands died in March of 1924. 322 Commonwealth continued to be owned by a trust established under her will, and Gertrude Sands continued to live there. She spent the winters of 1928 and 1929 at the Hotel Statler at 50 Providence, and the winters of 1930 and 1931 at the Lenox Hotel at 61 Exeter. 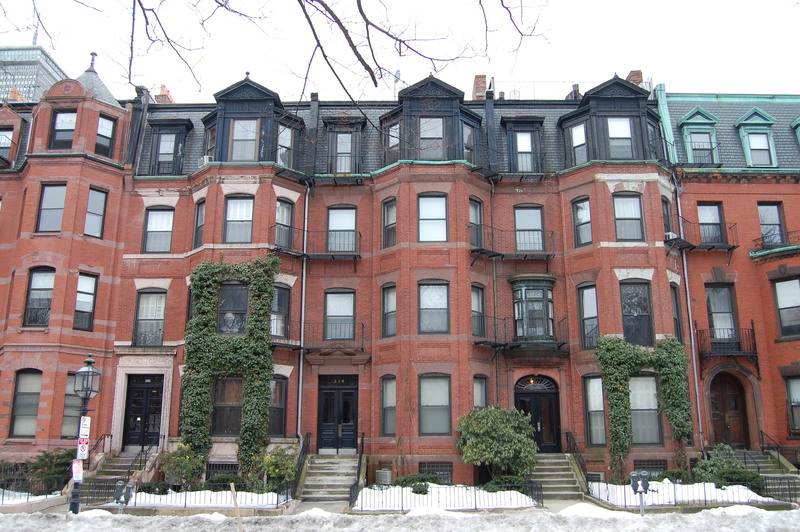 By 1933, she had moved to Roxbury but continued to be listed at 322 Commonwealth in the Blue Books through 1937 and probably spent part of the winter seasons there. She died in 1944. 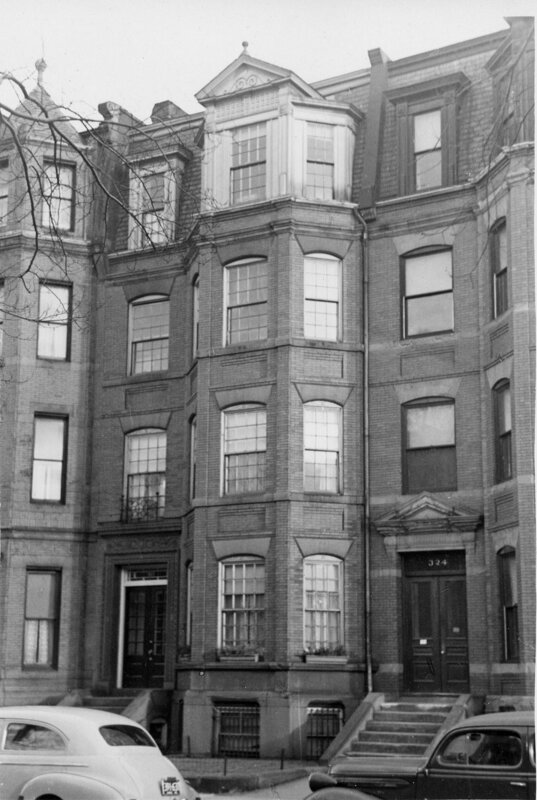 In August of 1936, William and Ethel (Sands) Duncklee’s son, William Sands Duncklee, as trustee under Frances Josephine Sands’s will, filed for (and subsequently received) permission to convert the property from a single-family dwelling into nine apartments. On August 29, 1978, 322 Commonwealth was purchased from William Sands Duncklee by Robert White. He already owned fourteen houses on the block: 324–326–328–330–332–334–336 Commonwealth, 344 Commonwealth, 348–350 Commonwealth, and 354–356–358–360 Commonwealth. In October of 1978, he purchased 346 Commonwealth. In December of 1988, Robert White applied for (and subsequently received) permission to convert 322 Commonwealth from nine to ten apartments. At the same time, he also applied for (and subsequently received) permission to combine it with 324-326-328-330-332-334 Commonwealth into one property with 63 apartments, to be known as 322-334 Commonwealth. 336 Commonwealth remained a separate property. 322 Commonwealth remained an apartment building in 2018.